We are getting VERY close to Fall, and with this time of the year, we tend to have more visitors in our home, with Summer being a close second. 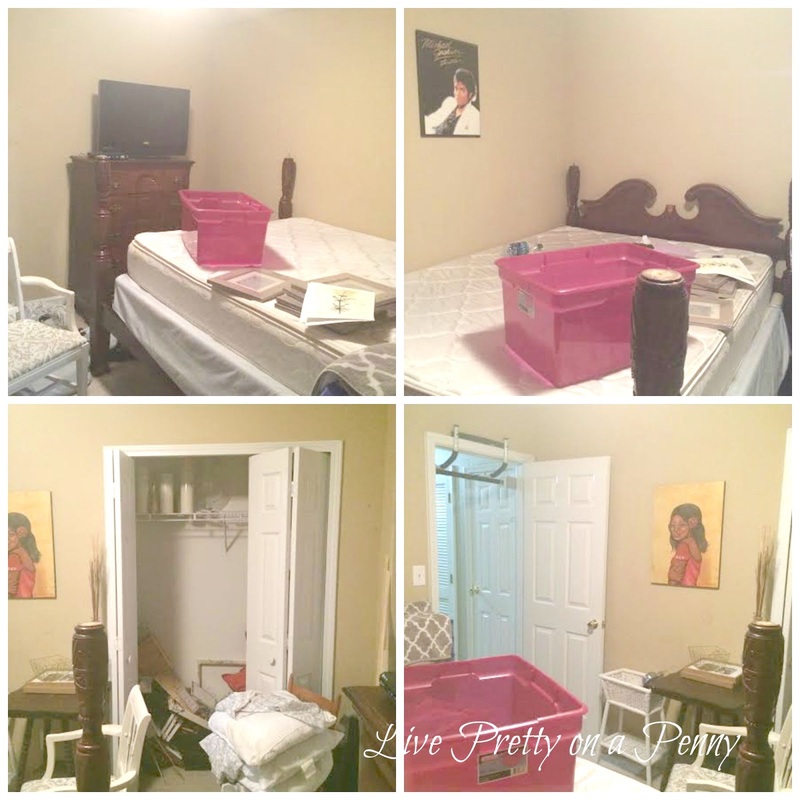 I have total of four bedrooms in my home and the main one that guests use when they visit had become a pure dumping ground, and even when it wasn’t in chaos, it was a beige bore. I even tried to reuse some old “art” that I had in my apartment to at least make it presentable, but I still hated it. 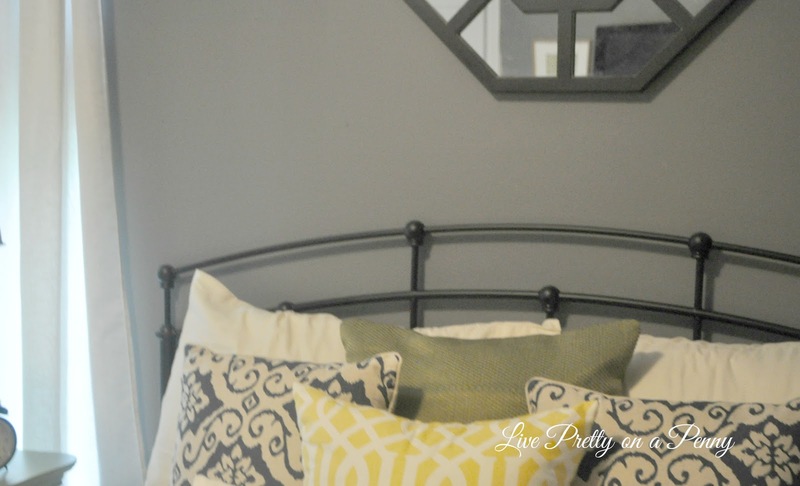 My husband’s old bed and chest of drawers is what we used for our guests.To be honest, it was never my favorite and I felt the original bed frame was too large and bulky this smaller room. 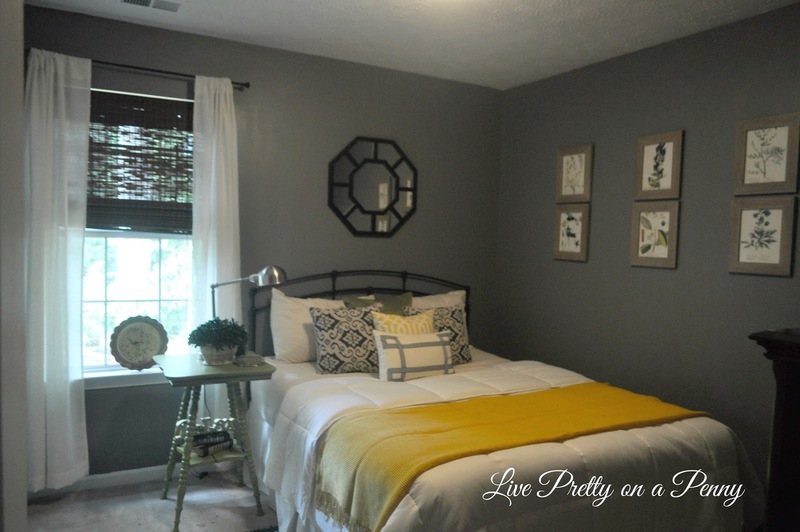 After winning a contest and scoring a gift card to a big box store for some paint essentials, I was able to plan a long overdue makeover for this room. 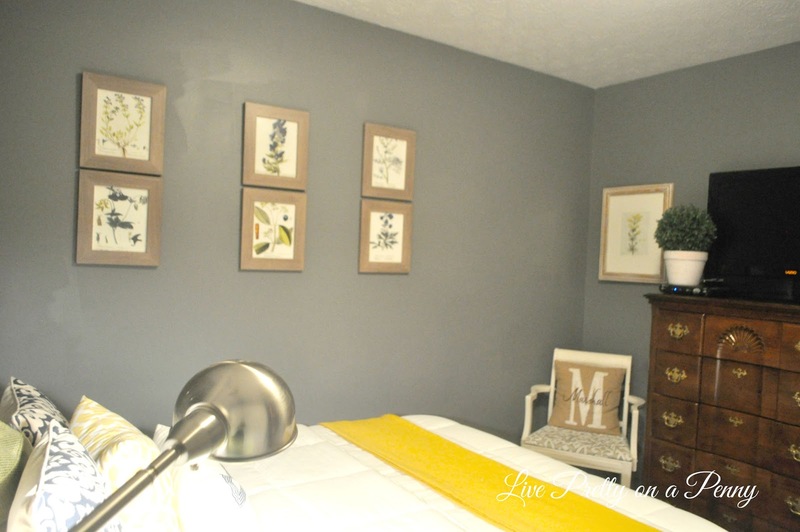 Although painting the room was the focus of the contest, that was just a start for me. . I love that it is full of thrifted, re-purposed, and inexpensive items. 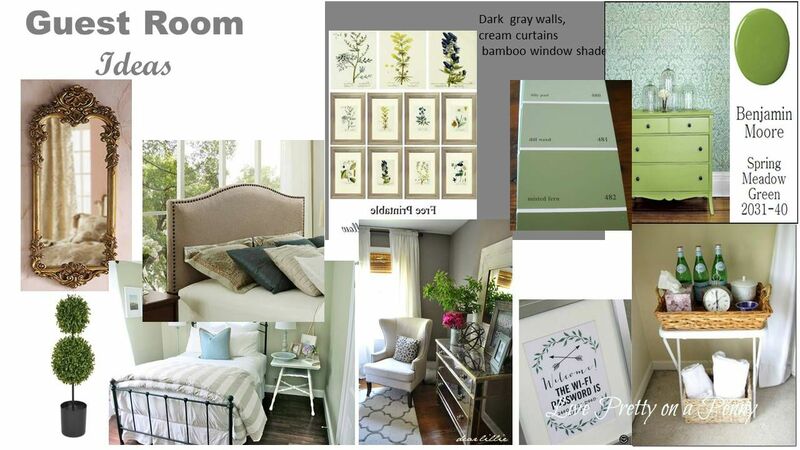 You may remember this plan that I put together as a guide to help me achieve the look I was going for in this room. 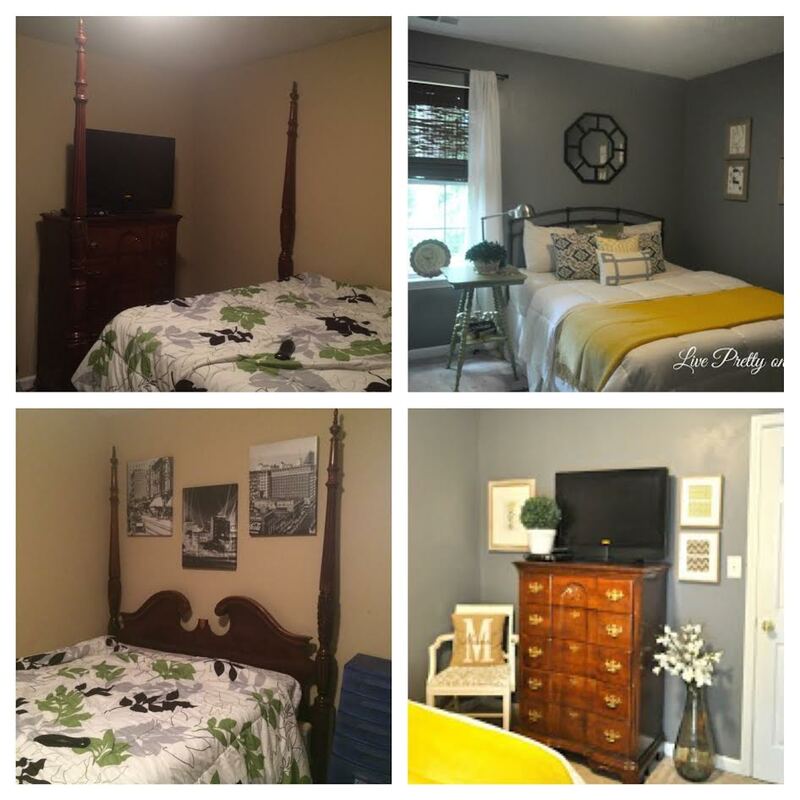 After getting rid of the bed on my local Facebook Yard Sale group, deciding on a headboard, painting the room Dover Gray by Olympic Paint and Stain, and following the theme of my idea board, the room came together beautifully!! The side table was a Goodwill purchase and I showed the before and after on Instagram. I know that the curtains are a little short. I plan to add fabric to them at some point to lengthen them, I just wanted the added height so I raised the curtain rod. 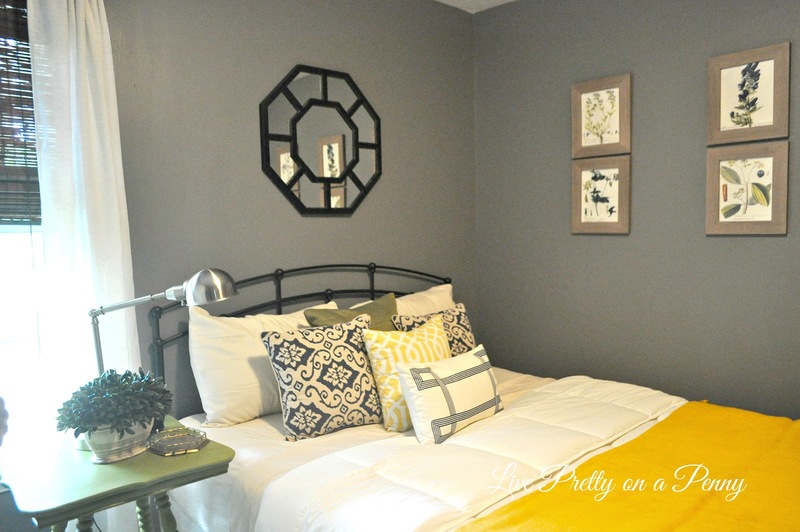 The headboard choice was the perfect choice for this room. It totally enhanced the bed and “breakfasty” look that I was going for. I chose to keep the chest of drawers in the original wood color, which is even shocking to me. I just felt like it flowed better in its original wood form. I sprayed the handles using Krylon Gold spray paint to freshen them up. The chair was originally in the family room and has found a new home here. The boxwood pot is from Marshall’s and all of the framed botanical art is from here. The Marshall pillow is from this Etsy shop. 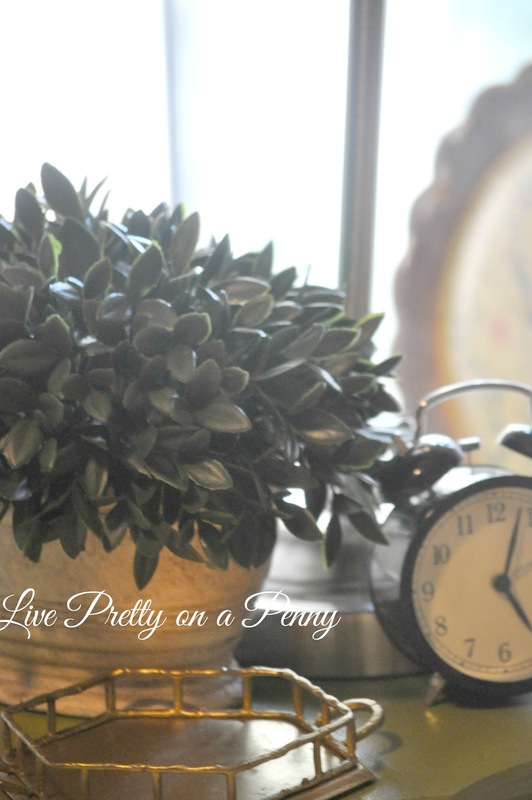 On the nightstand, I placed an old fashioned alarm clock that I purchased from Goodwill, along with a lamp, brass tray, and some faux greenery. It came together nicely. Even at night, I love how it looks. 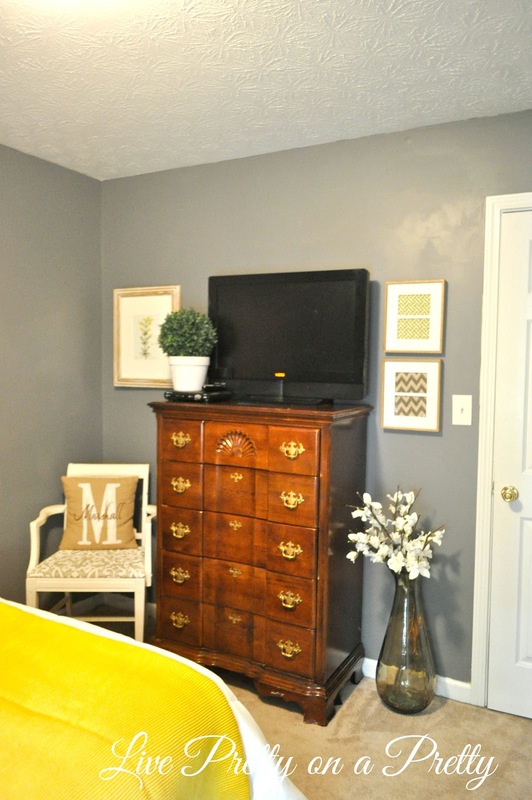 tv.Where the chest was, is now the wall where the bed for the bed. 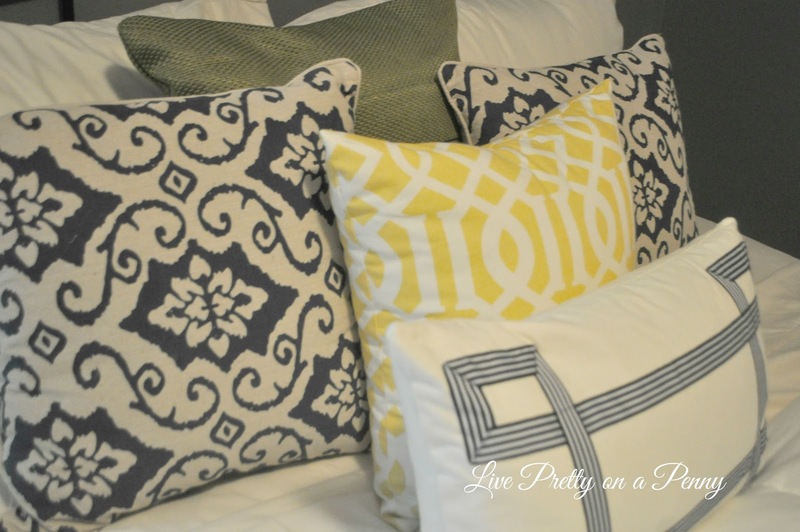 The mix of pillow patterns is one of my favorite elements. 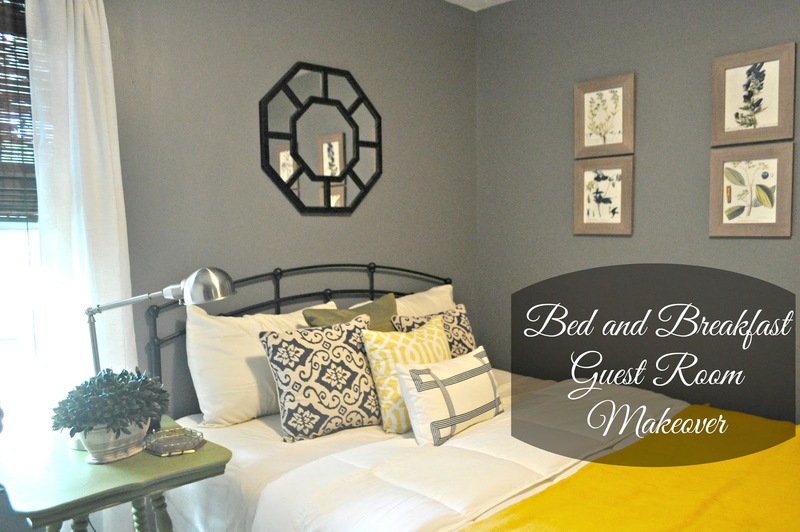 I think its important to accommodate guests when they visit and make their stay enjoyable and relaxing. 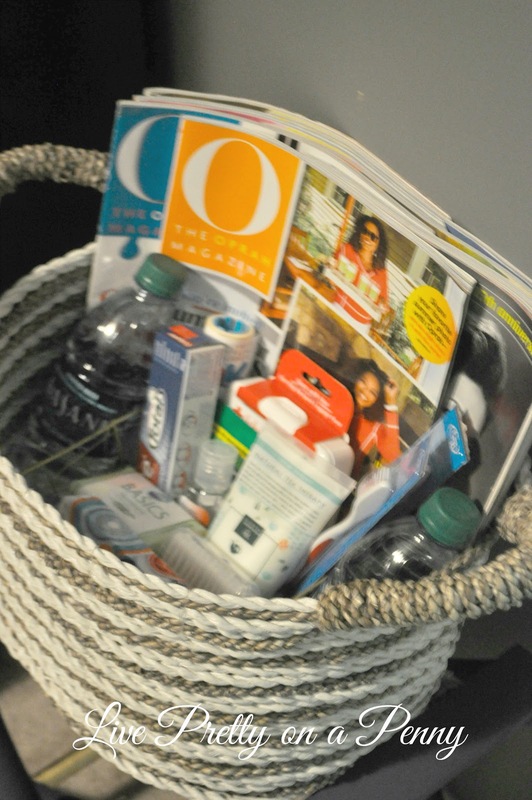 For me, putting together this basket of essentials was important for me. If you come to my house and forget something, hopefully you will find it in this basket! I scored this luggage rack from Goodwill for $5 and knew I had to have it. I gave it a quick makeover with navy blue and gold spray paint. 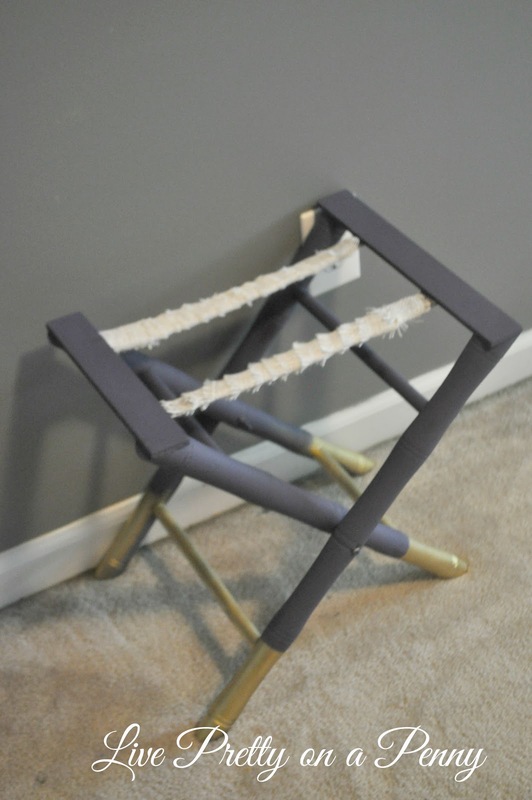 A luggage rack in a guest room is a great added detail. 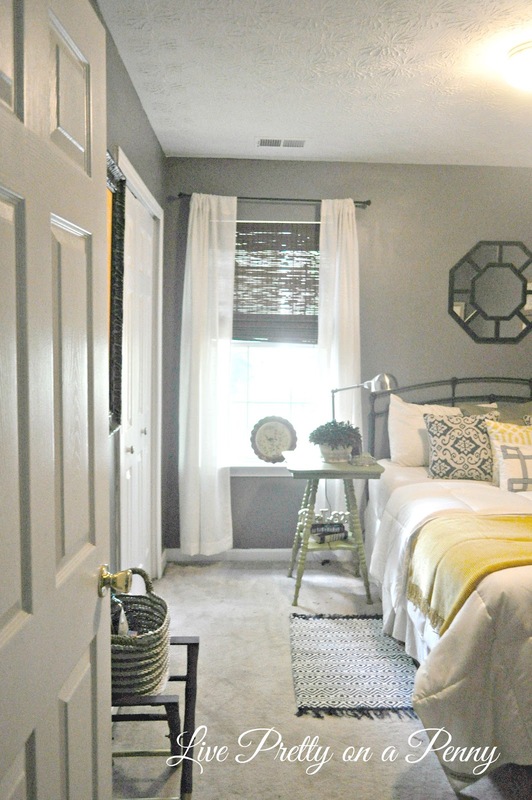 I just love to see transformations and the potential that any room in our homes have, and it does not have to break the bank! Take it from me…with the cost of childcare alone, our budget is a lot tighter. So my goal has always been to source the least expensive items that still give a large bang. I just love this view into the room. After adding up everything, I spent around $250 for everything, which is nothing for an entire makeover. I had gift cards as well, so that reduced my out of pocket costs of course. 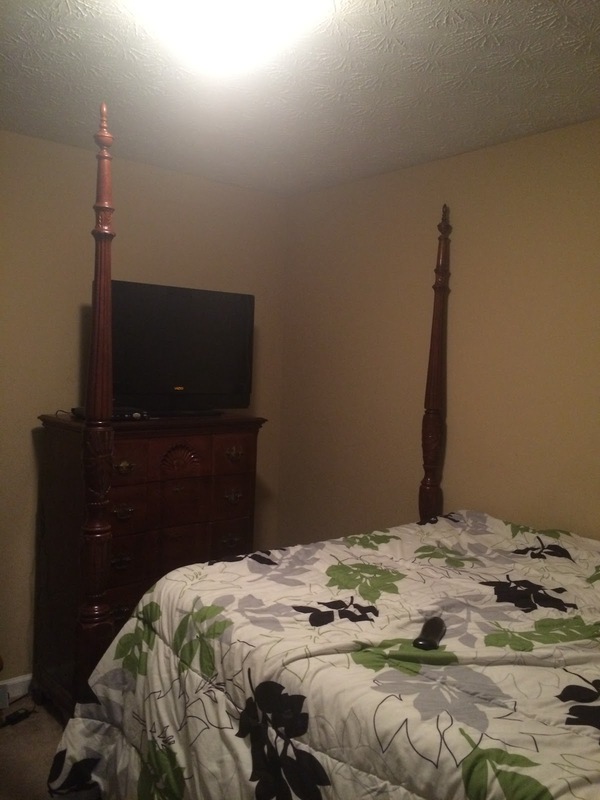 If you have any questions regarding any of the items in this room, let me know. Feel free to email me or leave a comment below. As always, thanks so much for stopping by. Until next time. I love the makeover! all the colors look great together. 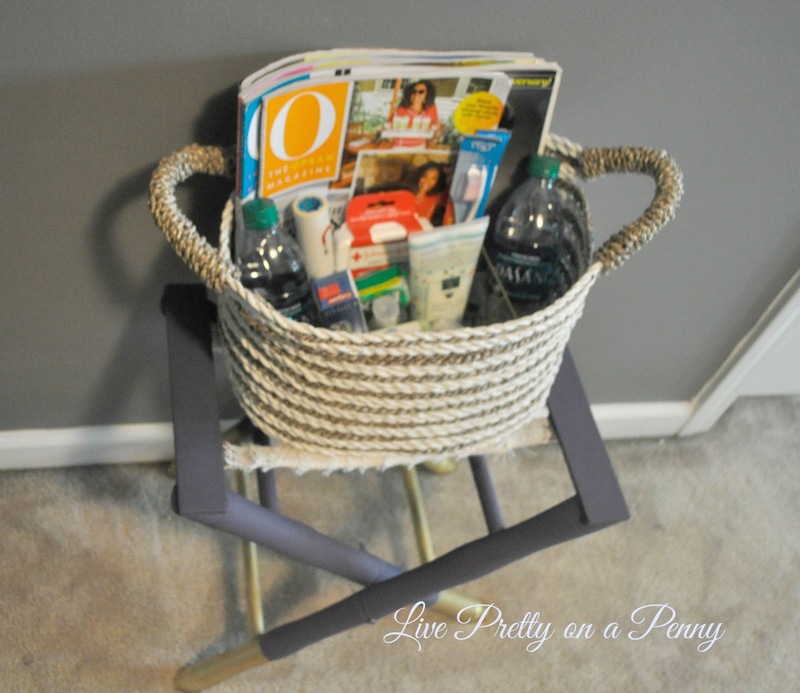 And I might have to steal that guest basket idea! Such a great way to make sure everyone has everything that they need! 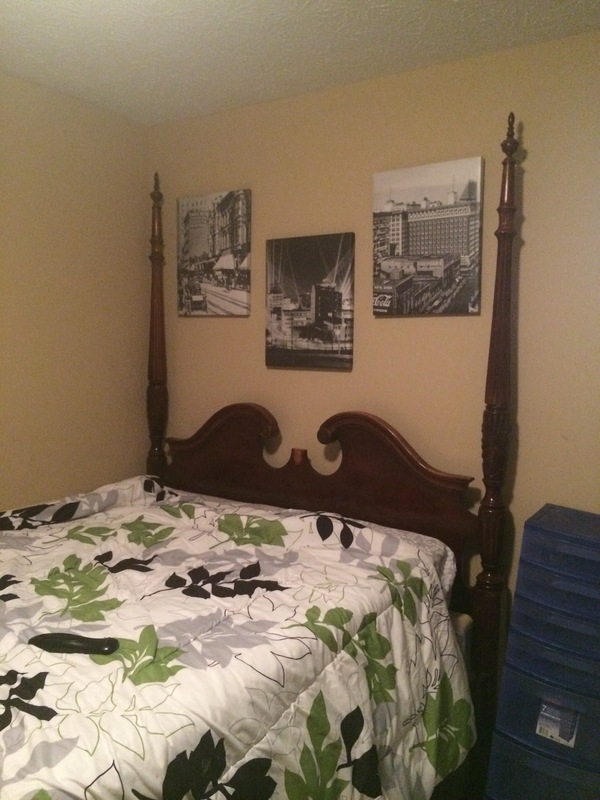 Erin, your guest room looks amazing. There are so many things that I love about it. The paint color on the walls, the side table, the accessories that work perfectly and the adorable basket for your guests… very nice indeed… :)Happy Autumn! Thank you Dee. I am so happy with how it turned out. Feels good to have it done! Yes, grey is my favorite. Its my go to color, just different variations all over the house. Thanks for stopping by! 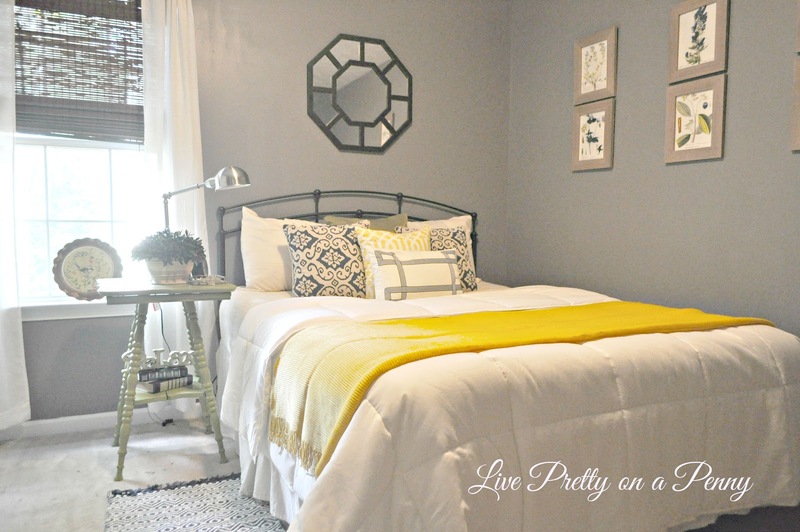 Erin your guest room looks lovely, and so inviting! I also love the shade your choose of the walls very pretty! Thank you so much, Katrina!! It looks amazing, Erin! I would love to sleep here. I especially love the luggage rack!! 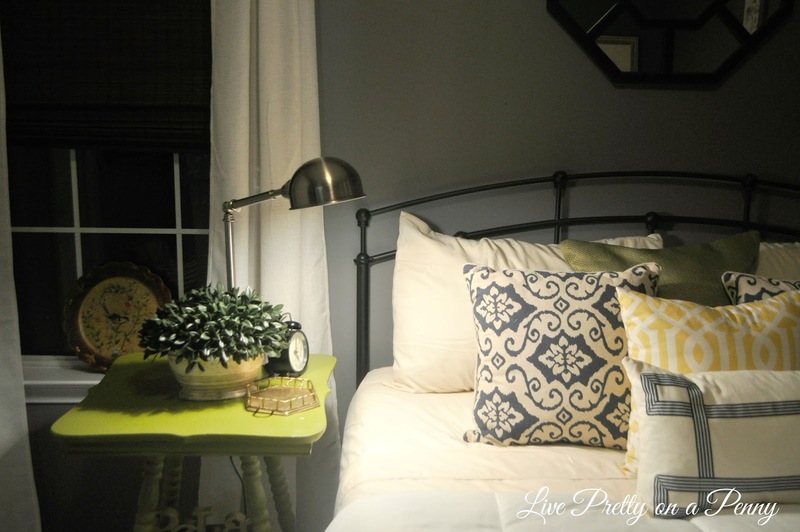 Love your room makeover! Great job!